For those of you who know Dungeons & Dragons and D&D Next, skip the first 2 paragraphs. For those of you who don’t know, Dungeons & Dragons (D&D) is the quintessential table-top role-playing game (TTRPG). I’ll save the details for an RPG Primer in the future, but the fundamentals are as follows: In D&D, you create a character and team up with the other players’ characters and go on adventures. You can do pretty much whatever you want, using your character’s statistics and die rolls to determine success or failure. You explore cavernous dungeons, evade cunning traps, and fight ferocious monsters, all to either get rich or rescue the princess or whatever else you can imagine. It’s a free-form game, and one player must be the Dungeon Master (or Game Master, more generically), who designs the dungeons or adventures, and plays all the enemies and other non-player characters (NPCs). Since its first release in 1974, it has been through many changes in system and rules, all of which have encouraged slightly different ways of playing. When each new edition is rolled out, many players remain ardently attached to their older, favorite edition, while new players are attracted to the features of a new edition. Currently, Wizards of the Coast – the company who owns D&D – is making a new 5th edition of D&D, currently called D&D Next. To be honest, I’m not sure how excited I am for it. The approach that the designers are taking is, in my opinion, a recipe for failure. Let me explain what I mean: Beginning in early 2011, Mike Mearls, the senior manager for research and development of D&D Next, began writing about a new take on some key features of D&D. He talked about getting back to the basics of D&D while utilizing all the best innovations of later editions. Polls were used, asking you which ‘option’ you would prefer. If there weren’t several options discussed in the article, then polls asked how much you agreed with the idea presented in the article. Then they announced that they would be making a new edition (in case there was anyone who hadn’t figured that out already), and started asking if X idea or Y idea feels more like D&D. After the first playtest documents were released and tested, they sent out a questionnaire asking you to identify the most iconic spells from a list, again, asking which ones feel most important to your D&D experience. OK, so what’s the problem? The problem is, simply, that they are attempting to crowd-source their design goals. They want the fanbase to tell them what they think will make a good D&D, which means they are not pursuing any single vision of a good game. This approach, I fear, will lead to a smattering of features and rules that are all over the place; the designers have even said themselves that the feel of the rules must trump the math of the system. I don’t even know how you can choose between a feel and the math, since it seems to me that the math creates the feel, but that attitude, that non-commitment to a solid rule-set, combined with the idea that fans on the internet will give them a good vision for where the next edition needs to go, is terrible leadership on display. Businesses need visionary leadership. Steve Jobs was opposed to market research because he thought “People don’t know what they want until you show it to them.”* While not everyone can, like Jobs, be right about that, the lesson to be learned is that customers don’t necessarily know what will make a good product: Customers can identify issues, but rarely can they accurately identify solutions, and certainly not unanimously. It’s up to Mike Mearls to listen to his user base and then have the knowledge and intuition to know how to solve those problems – possibly in ways no one on the internet has even thought of – and lead his team to execute those ideas. But before you even get to that point, you need a clear foundation of goals you’re attempting to achieve. The current generation of D&D, 4th Edition, actually had those; execution was very spotty, and some of their goals were incompatible or ill-advised, but they at least had a clear vision for the game. So far, 5e has asked people on the internet to build its foundation while the team develops bits and pieces before it’s even in place. I think that’ll end up as bad as it sounds. With that in mind, I’ll be dedicating some of these posts to what my design goals would be for a new edition, and talk about ways to achieve them. Some of these will be good, some won’t. Much of my game design philosophy and knowledge comes from The Gaming Den, so feel free to check that place out, but be warned; it can be an unfriendly place. As I go forward, please comment with your perspectives and ideas; your thoughts may inspire me or others to make great things in the future. *That’s an extreme example, where he had the best creative minds in the world creating whole new products and platforms, making disruptive innovations, so market research wasn’t really that applicable. WotC is not in that position with D&D Next, but compared to what’s happening, I’d welcome some managerial risk-taking. This entry was posted in Dungeons & Dragons, Game Design, Games, TTRPGs and tagged 5e, D&D, D&D Next, design goals, Dragons, Dungeons, game design, leadership, Mike Mearls, Steve Jobs by Stubbazubba. Bookmark the permalink. When 3E came out I knew virtually no one who was truly up-in-arms about it. Pretty much all the old-school players I knew were actually excited about it (myself included, and I started with AD&D). Why? Because conceptually it looked enough like the previous edition that people still recognized it easily as D&D. Our classes were there, our races were there, our spells were there, etc. Sure, there were mechanical issues that eventually got under some people’s skin, but the game was still D&D. 4E is when things really changed, and why Pathfinder was able to become so successful (using 3.5 as their model). 4E gutted the classes, introduced new nonsensical ones, changed the races for no good reason, completely homogenized the power acquisition/spell system (the most boring power system I have ever played). In short, 4E crapped on literally everybody who liked the concepts from earlier editions, and the reaction from the players I knew was extremely negative across the board. It was a disaster of epic proportions, which is why it collapsed so quickly. The irony is that WotC already had a great formula in-house for making a modern version of D&D that a lot of people could get behind: Star Wars Saga Edition. Instead of homogenizing the classes and powers, Saga provided the MARVELOUS talent tree system, allowing people to make exactly the flavor of characters that they wanted. It provided a great deal of choice and diversity (more so than 3E, and very much more so than 4E), and yet at the same time it was MUCH more balanced mechanically than 3E. It was quite literally the best of both worlds… and as close as WotC would ever get to achieving smart, modern game design. 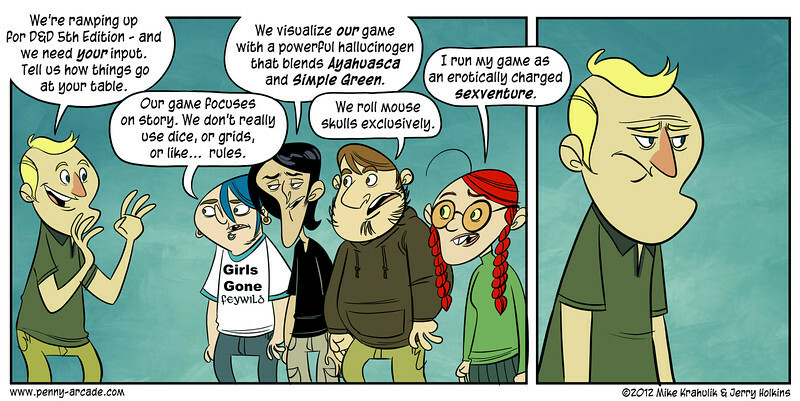 Why they didn’t use that same model for 4E is utterly baffling. And so now, just a few years later, they are trying again with 5E (D&D “Next”), and they are making some of the same glaring mistakes that they made before. They are introducing awkward new mechanics that only divide the fan base further, like the EXTREMELY controversial “bounded accuracy” system, whereby to-hit bonuses don’t ever significantly improve, and instead damage is supposed to somehow make up for it. The problem is that these idiotic mechanics don’t work well at all, and we have already found about 10 different problems with them that are so bad they are laughable. Furthermore, WotC still refuses to adopt a modern talent tree system, and instead are making power/feat acquisition as clumsy and ineffective as it was before. The only thing that D&D Next seems to accomplish is that it angers everyone, even the 4E people. If this is WotC’s attempt to get the pre-4E fans back, then they really need to go back to the drawing board and start over. For all intents and purposes, D&D is done.